How To Make A Hard Chocolate Shell For Ice Cream. This chocolate topping tastes much better than the bottled chocolate ‘magic shell’ toppings sold in supermarkets. This recipe is made with real chocolate. Nearly all of the commercially made products you find in supermarkets are made with inferior ingredients like palm oil. It’s cheaper to make this stuff that way, but predictably, it doesn’t taste as good. At the bottom of the pile, there are chocolate shell products sold at dollar stores that are made out of something called ‘natural chocolate flavor.’ I don’t know what it is, but isn’t made from cocoa beans. New in the Chocolate Room. 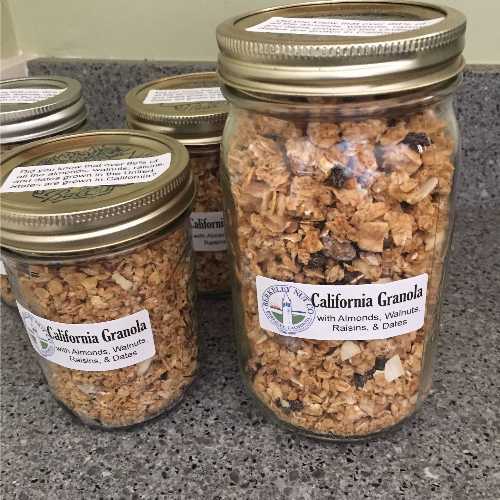 California Granola. I am making a new granola mix. It contains almonds, raisins, walnuts, and dates. 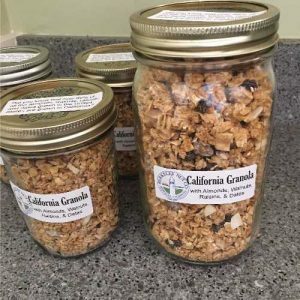 I call it California Granola because nearly all of all the almonds raisins, walnuts, and da tes grown in the United States come in California. I have it in 8 ounce and 16 ounce jars. Most people, even people here in California, don’t realize how much of our nation’s food comes from California. Nearly 100% of the following crops come from California: apricots, artichokes, broccoli, cauliflower, celery, figs, garlic, grapes, kiwifruit, nectarines, olives, clingstone peaches, pistachios, plums, pomegranates, and strawberries. Is There Lead In Hershey Bars? Would you pay $14,000 for a box of 6 chocolate truffles? Believe it or not, that is what Ross Ltd. is charging. Ross is located in Kazakhstan, an oil-rich country with petro-millionaires and billionaires, although most people living there are dirt poor. The prices that some rich people are willing to pay for snob appeal products always amazes me. Have these people nothing better to do with their money? If you want to know what could possibly justify a price of $14,000 for a box of chocolates, the answer is simple – NOTHING! To see what these truffles look like, go to: $14,000 Truffles. NEW IN MY CHOCOLATE ROOM. 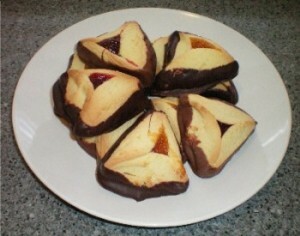 HAMANTASHEN. I’ve got handmade raspberry and apricot filled hamantashen in the chocolate room, bottom-dipped in semisweet and milk chocolate. Because they are handmade, no 2 are exactly alike. This is a seasonal item and will only be available for a short time. The word ‘hamantashen’ means ‘Haman’s pockets’ in Yiddish and German.P.S. 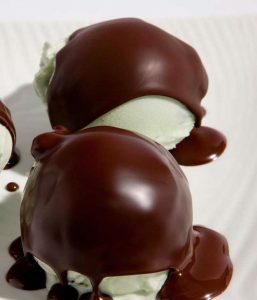 – I don’t often make make chocolate truffles. They are too time consuming. However, if you are willing to pay me $14,000, I will make up a very nice box of truffles – just for you! 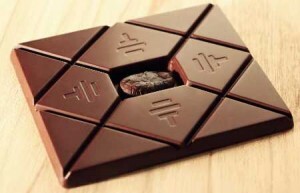 Woulr You Pay $260 For A Chocolate Bar? 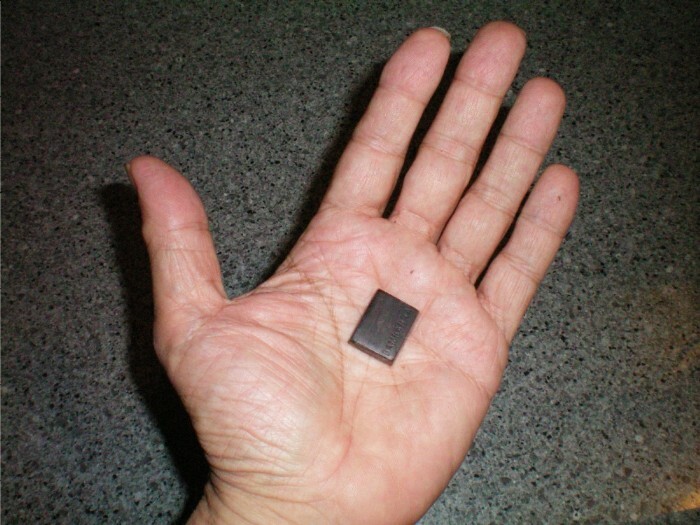 A 50 gram (1.8 ounce) To’ak chocolate bar sells for $260. Each To’ak chocolate bar is packed in a wood box and comes with a 115 page guidebook. By contrast, my chocolate bars do not come with a guidebook. You have to figure out how to eat my chocolate bars all by yourself and without written instructions. To’ak chocolate bars are made from a very rare and genetically pure variety of cocao bean called Nacional. Nacional cocao trees were thought to be extinct. The variety was nearly wiped out in 1917 by an outbreak of witch’s broom disease; however, a few of these trees were recently discovered growing in a remote area of Ecuador. There aren’t many of these trees. Despite the high price, To’ak chocolate bars are selling well. Nearly all the To’ak chocolate bars that will be available this year have already been sold. To order To’ak chocolate bars, click here: $260 Chocolate Bars. If you prefer boxed chocolates and money is no object, may I recommend Debauve & Gallais’ Le Livre. Le Livre (‘book’ in French) is a collection of 35 individual chocolate pralines and ganaches packed in a box designed to look like an elegant book. It costs $550. If that is too expensive for you, you can order the Petit Livre (small book) for only $330. To order, go to: Debauve & Gallais. TRIPLE GINGER COOKIES. These chewy cookies are made with 3 kinds of ginger: fresh, powdered, and crystallized. They also contain molasses and cinnamon and are topped with crystallized sugar. I bottom dip them in dark and milk chocolate. I like Dutch spice cookies like these, but they are often hard to find in stores. MADELEINES. Most people think of madeleines as cookies, but they are actually small sponge cakes. 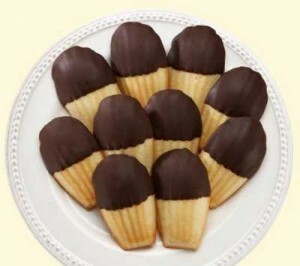 My madeleines are made using a traditional French recipe. That means there is a lot of butter in them. I top dip them in milk and dark chocolate. Marcel Proust and Madeleines. Just before World War 1, Marcel Proust published ‘Remembrances of Things Past’. The book became an immediate best-seller. In his book, Proust recounted his childhood memories. He had a lot to say about madeleines and he said it in a way that made everybody want them. Before the publication of ‘Remembrances of Things Past’, most people, even in France, had never seen or heard of madeleines before. Madeleines were only made in a few towns in Lorraine, a province in northeastern France. As soon as Proust’s book came out, people all over the world went to bakeries demanding madeleines. Below is a small bit of what Proust had to say about madeleines. “One day in winter, on my return home, my mother, seeing that I was cold, offered me some tea, which I did not ordinarily drink. I declined at first, and then, for no particular reason, changed my mind. She sent for one of those squat, plump little cakes called ‘petites madeleines,’ which look as though they had been molded in the fluted valve of a scallop shell. And soon, mechanically, dispirited after a dreary day with the prospect of a depressing tomorrow, I raised to my lips a spoonful of the tea in which I had soaked a morsel of the madeleine. No sooner had the warm liquid mixed with the crumbs touched my palate than a shudder ran through me and I stopped, intent upon the extraordinary thing that was happening to me. An exquisite pleasure had invaded my senses, something isolated, detached, with no suggestion of its origin. And at once the vicissitudes of life had become indifferent to me, its disasters innocuous, its brevity illusory – this new sensation having had on me the effect which love has of filling me with a precious essence; or rather this essence was not in me, it was me. I had ceased now to feel mediocre, contingent, mortal. Whence could it have come to me, this all-powerful joy? I sensed that it was connected with the taste of the tea and the madeleine.” – Marcel Proust. Proust was a pretty convincing madeleine salesman, wasn’t he? Competition With My Free Chocolate Room? I recently toured Varsity Berkeley Apartments in downtown Berkeley. This is a huge complex. The building runs across an entire block. The building is still under construction, bu they are signing leases now for occupancy in late July. The rent on 2 bedroom apartments ranges from $3,750 to $4,200 a month. Parking is extra. They are advertising these apartments as rentals for college students, hence the name ‘Varsity Berkeley’, but I wonder – how many college students can really afford to pay $4,000 a month for a 2 bedroom apartment? What is a ‘luxury apartment’? The sales brochure says that you will ‘live in luxury’ at Varsity Berkeley. It seems like every new apartment house in Berkeley uses the word ‘luxury’ to describe their apartments, but what exactly does that mean? ‘Luxury apartment’ could mean almost anything and based on my observations, it usually just means ‘expensive.’ If there is a legal definition of the word ‘luxury’, I would like to know what it is. To be fair, Varsity Berkeley has some very nice amenities, including a spacious rooftop garden. They will also have valet garbage collection. That means they will pick up your garbage at your apartment. You won’t have to carry your garbage to a garbage can or a garbage chute. That is not a service that I provide. I do not pick up my tenants’ garbage and put it in their garbage cans for them. Varsity Berkeley has some interesting swag at their rental office. They have free bags of gumballs with the name ‘Varsity Berkeley’ printed on the bag, but I wonder if that is enough to get people to sign leases. 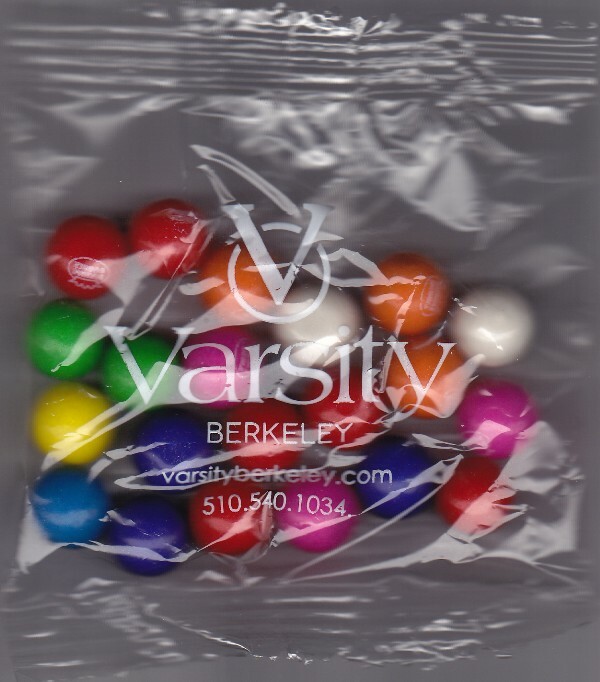 I always keep my eye on Berkeley landlords who give free candy to their tenants; however, I am not convinced that bags of gumballs are real competition with my free chocolate room. You know, you can buy a lot of gumballs for $4,000 a month! 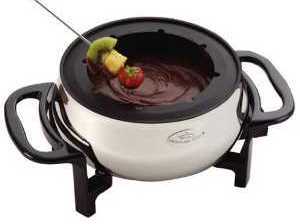 If you would like to serve chocolate fondue at your next party, come and see me. I will lend you my chocolate fondue pots and forks and give you the fondue chocolate. All you will need is cream and stuff to dip in the fondue, like strawberries and bananas. Chocolate fondue is very easy to make. You just put chocolate and cream in an electric fondue pot and turn the thermostat on ‘low’. When the chocolate is melted, stir it up, and you’re done. It’s as simple as that. This isn’t a simplified recipe. This is the way dessert professionals make it. Chocolate fondue is great for parties! And it is easy and fun to do! Isis Chocolate will soon be changing the company’s name. Isis Chocolate, a high-end Belgian chocolate company, will be changing its name to Libeert in January. The company has been in business for nearly a century and has a worldwide reputation for superior chocolates, but sales have been hurting because of the Islamic state group in Iraq and Syria with the same name. Apparently some people think that Isis Chocolates is some kind of fundraiser for the Islamic state. Can you imagine anyone believing that? Can you picture heavily armed Islamic terrorists setting up card tables in front of Giant supermarkets and selling their own brand of chocolate bars next to the Girl Scout cookie and the Boy Scout popcorn tables?